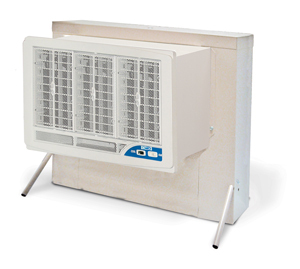 Direct evaporative coolers are available as small portable and window units for cooling a single room as well as larger units that can cool the entire home. A direct evaporative cooling system is the simplest and most popular evaporative cooling system available. You can duplicate the principle behind direct evaporative cooling by wrapping a wet handkerchief around your neck on a hot day and standing in front of a fan. It takes heat energy to change water (or any liquid) from a liquid into a vapor. As the water in the wet handkerchief evaporates, your body gives up heat and you feel cooler. Direct evaporative cooling can be an economical alternative for air conditioning needs in certain climates. Your Dr. Energy Saver dealer will be able to tell you which systems would work best in your home. To learn more, contact Dr. Energy Saver today for a home energy audit! How does direct evaporative cooling work? A direct evaporative cooling system is a very simple piece of equipment with only a few basic components. A large fan pulls hot air through a dampened sponge-like pad, and distributes the resulting cooler air to the interior space either directly or through ducts. Typically, windows must be left open to allow the cool air to circulate. Ceiling vents to a ventilated attic may also be used. A direct evaporative cooling system works best in a hot, dry climate where it's okay to add humidity to air while cooling it. In hot, dry areas throughout the Southwest, this type of cooling system is an economical alternative to refrigeration-based air conditioning. If you live in the Southeast, where summer weather is hot and humid, a direct evaporative cooling system is not a wise choice. Instead, consider an indirect evaporative cooling system, or a conventional refrigerant-based AC system. Whether evaporative cooling or another air conditioning system is right for you, Dr. Energy Saver will have the solution you need to ensure comfort throughout your home. Start saving money today by calling in your local dealer to install energy-efficient air conditioning!